There’s no surprise Hull has been made the City of Culture this year, with great bands arising from the city almost every week. Cannibal Animal, though not new, are one of Hull’s finest at the moment. 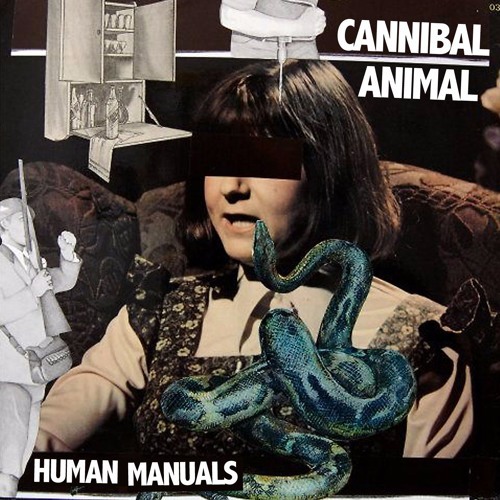 Heavy punk riffs with crunchy vocals and ferocious drums, the bands first EP Human Manuals did not disappoint. Kicking off with spooky acapella vocals, first track ‘Pincushion Postcard’ quickly fires into a fast and distorted bass riff, with shaking guitar lines over the top which give the listener a sense of uncertainty and fear. This continues on throughout the EP, with even more slightly discordant guitar notes and eerie vocals. Final track ‘Grand Theft Manual’ is definitely the stand out track of this release. An in-your-face Punk song, with an equally intimidating video where we see lead vocalist Luke Ellerington walking through empty fields and factories, whilst bassist Jamie Hanson and drummer Thomas Joad Gibbins walk behind him wearing all-in-one body suits similar to those worn at the clearing of a crime scene. It would be easy to place Cannibal Animal in the same playlist as all of your other favourite Post-Punk bands, and you should. But they’re more than just Post-Punk, they’re something completely original. With doom ridden riffs and the ability to make you tremor they’re most certainly not ones to ignore.